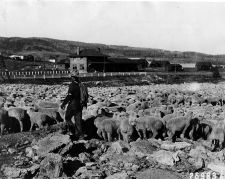 Tread of Pioneers Museum/courtesy Sheep at the Steamboat Springs Depot awaiting shipment to market. To help celebrate the event, the Tread of Pioneers Museum, Bud Werner Memorial Library, and the Community Agriculture Alliance will co-host �Historic Agriculture in the Yampa Valley: Longtime Perspectives on Farming, Ranching and Gardening.� This panel discussion takes place on Monday, March 23 at 6:30pm at the Bud Werner Library and features agricultural producers who have a long hands-on history in the Yampa Valley, plus three generations of Routt County CSU Extension agents. The program�s panelist include: Dean Look - Routt County Native, Rancher and Outdoor Enthusiast; Rita Herold - Routt County Native, Rancher, Educator and Historian; Sam Haslem, CJ Mucklow and Todd Hagenbuch � Three Generations of Routt County CSU Extension; and moderator, Marsha Daughenbaugh � Executive Director of Community Agriculture Alliance. Then, on Friday, March 27 at noon, at the Tread of Pioneers Museum, we will host Diane Holly and Marsha Daughenbaugh of the Community Agriculture Alliance for a history presentation titled �Rugged Ranch Women: From Dawn to Dusk.� Diane Holly, a member of a local Centennial Ranch family, will introduce you to some of the local women, from the past and the present, whose essential roles on their ranches cannot be overstated. The Tread of Pioneers Museum is full of fascinating stories and exhibits that uncover agriculture�s deep roots in the Yampa Valley. Don�t miss our newest installment in our Foundations of Steamboat series featuring the Semotan family. Whether its locally homesteading in 1886, running a large cattle operation, or becoming a major founder of today�s American Quarter Horse, the Semotan family ranching roots run deep and wide. The Semotan family exhibit is on display through February 2016. We hope you�ll join us by celebrating National Agriculture Week and increase the understanding and appreciation of our valley�s heritage and future. Where would YOU be without agriculture? Naked and hungry. *For more information about all of the Agriculture Appreciation Week events go to www.communityagalliance.org.